In the video on this page, expert and online Osteopath Tim Judd explains the triggers to arm or hand pain or elbow problems, how the arm and hand functions and the reasons for discomfort and pain in men and women. Now that you understand what causes arm and hand problems and how to prevent the most common arm, elbow, wrist or hand problems, it is time for targeted exercise to improve the range of motion. Click here for a sample of just one of the 12 Arms and Hands Stretches available to you. For immediate relief of arm or hand pain, tension, or arm and hand stiffness and fatigue, go here for Essential Arm and Hand Exercises that can relieve stiffness and discomfort, or add to cart now. 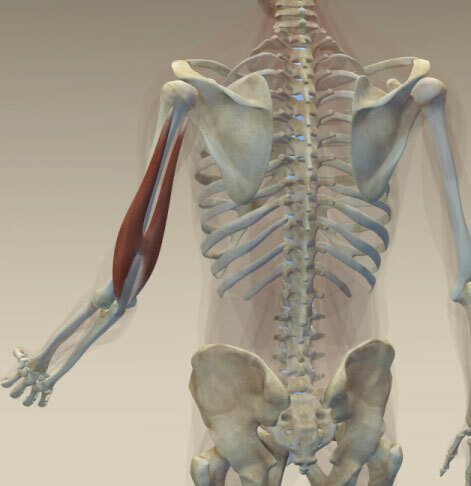 Learn about arm or hand pain and arm and hand joint pain relief through medical anatomy and 3D animation. What causes chronic arm pain problems? What causes chronic hand pain. What are the most common arm or hand conditions? Why do I get elbow joint pain? What is carpal tunnel syndrome? Is it the main cause of wrist joint pain? What is carpal tunnel pain? What is the relationship between your shoulders and arms? What is the relationship between arm and hand muscles? Understand the symptoms of arthritis and how it affects hands and arm joints. How do you stretch your arms and hands? Most arm or hand pain problems in the forearm and elbow. These are caused by repetitive strain or occupational over-use syndromes. Pain in these two areas can range from mildly disturbing to completely debilitating. Significant pain and loss of function can affect your ability to carry out simple everyday activities like holding a cup. There are two groups of muscles on the forearm. The flexor group on the front curls the wrist, hand and fingers. The extensor group pull the hand back and straighten the fingers. 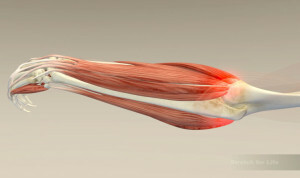 All of the flexor muscles attach to a point on the inside of the elbow while the extensor group all attach to a point on the outside of the elbow. Herein lies the problem for the forearm. Large bundles of muscle attaching to a relatively small attachment point. The muscles of the upper arm – the biceps on the front and the triceps on the back – don’t need a lot of stretching unless there has been damaged tissue. In this case you should be under osteopathic care. When the tension in the muscles builds up from over-use, there is such a drag on the attachment point that the tendon and even the bone can become inflamed. This is the case where poor technique and repetitive assault on the forearm muscles cause tennis and golfers elbow, medically known as lateral or medial epichondilitis. This causes tightness and pain in the belly of the muscle and considerable pain and inflammation at the attachment points. This disturbance reflects out to the hands which mostly work from the muscles in the forearm. Repetitive strain can develop from typing to knitting, from operating machinery to hairdressers to mothers holding babies. Too much tension in your shoulders and upper back puts more strain on your forearms and hands as they try to compensate for inadequacies in the upper regions. Stretching is usually not enough to rehabilitate forearm muscles. I have found stretching and deep massage to be the most effective. Acupuncture is a great adjunct to the program but only in combination with the stretch and massage. It is usually about the only time that I suggest to my patients to take anti-inflammatory medication as deep massage can be really painful but very helpful. 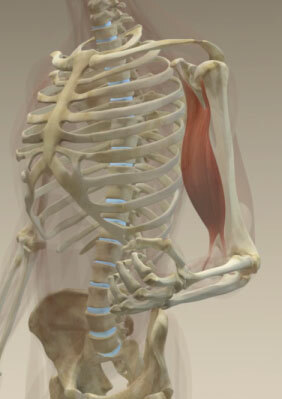 Feel around the muscles in your forearm just below your elbow and see how they feel. Are they a bit sore or really uncomfortable? Can you feel pain without even touching them? Whatever your situation these exercises will be exceptionally beneficial for relief, repair and maintenance. To read more from Tim’s Blog click here. To check out Tim’s Auckland practice click here. For information about conditions that affect the arms and hands click here.